Haldi is the cornerstone of South Asian life. Just a pinch of the rich golden powder makes us nostalgic as we think about haldi ceremonies, yellowed hands, and the deliciously golden shaahi paneer. 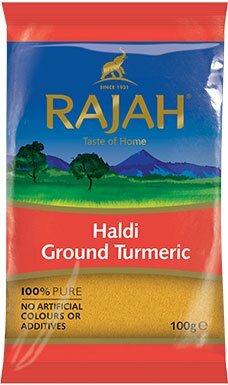 Since time immemorial, haldi has been used in ancient medicine and cooking across the world, especially in Asia and the Middle East. In India, it symbolises heart-warming food, good health, and cultural sanctity. The golden spice literally rules the humble masaledani (spice box). It occupies a permanent place in kitchens and lunch boxes across villages and cities. It also plays an integral part in cultural customs and traditions. It is known for its medicinal properties and is also used as a dye. The name turmeric itself is thought to originate from the word terra merita, which is Latin for deserving earth. This exotic spice is a part of the ginger family and is grown as a root primarily in south-east India. The earthy haldi root requires a climate of 20 to 30 degrees Celsius in order to flourish. Once ripe, farmers dig up the root carefully. They boil it until they know the root is soft and the flavour and colour is enhanced. Next, the brown skin is carefully removed to reveal the bright yellow haldi inside and left to dry in the shade, away from the colour-leaching sunlight. Finally, experienced hands grind the dried root and sieve it into a fine yellow powder, ready for your masaledani (spice box). Store your haldi powder in a cool, dark space. Keep it in a tightly closed container away from direct heat and sunlight so that it retains its bright yellow colour and earthy flavour. Be careful not to get it on your clothes as they can stain. Used for centuries in India and China, haldi is known to have a surprisingly wide range of properties that help with healing and good health. A pinch of turmeric mixed in a cup of hot milk is a popular nuskha or home remedy to fight a cold. Dabbed on an external wound, its anti-inflammatory properties can help heal wounds. It’s also good for digestion, joint pain, and liver conditions. In recent times, turmeric’s main component curcumin was found to possess properties that treat cancer. The humble turmeric is definitely a treasure trove of health benefits.